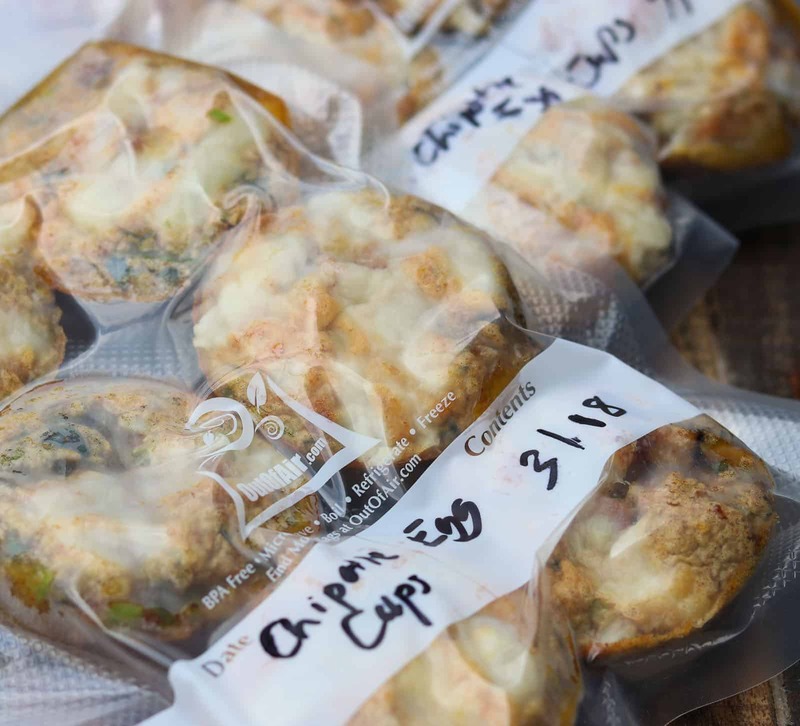 I love these Crustless Chipotle Egg Cups best right out of the oven but they still are delicious reheated for a quick breakfast. Just pop them into the microwave for about 1 1/2 minutes. Serve one with a bowl of fresh fruit and you have a delicious and filling breakfast. Only 1 Smart Point per cup with the Freestyle Weight Watcher Plan! I like to use my Kitchen Aid mixer for this, but feel free to mix in a large bowl. Here are the Chipotle Egg Cups flash frozen and ready to be packed in the Food Saver Bags. All ready for future breakfasts! Just pop one of these Crustless Chipotle Egg Cups in the microwave and 1 minute 15 seconds they are ready to eat! Quick breakfast on the go! 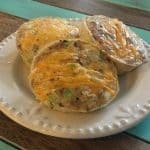 Make up a batch of these Crustless Chipotle Egg Cups and always have breakfast ready in a jiffy! I routinely make a batch or two of these and flash freeze them on a cookie sheet, then transfer to ziplock bags in my freezer. When I need breakfast, I microwave one for 1 min 15 seconds. Packed with protein and goodness for only 1 point! One thing to note, use silicone muffin pans. They “pop” right out! Otherwise you spend too much time cleaning the metal tins even if you spray them heavily. Preheat oven to 350°. Spray silicone muffin cups (2 sets of 12) with cooking spray and place cups on a cookie sheet. In a large bowl, mix eggs and remaining ingredients except cheese. I like to use my Kitchen Aid Mixer. Scoop about 1/4 c. of egg mixture into each cup. Try a get a little of the “good stuff,” at the bottom of the bowl for each egg cup. Distribute the shredded cheese evenly over each cup. Bake 18-30 min until set. You don’t want them overdone. Every oven is different. If you use a convection oven, bake time is about 18 min, where as a regular oven may take up to 30 min. Take them out when they don’t, “jiggle,” when you gently shake the pan. Carefully remove each egg cup with two forks on either side, or sometimes I run a knife around each up before I pull them out. Transfer to a plate to cool. When cool, transfer to a cookie sheet and place in the freezer. Flash freeze for at least 10-20 min then put into Ziplock bags or freezer sealed bags. When ready to eat, place egg cup on a plate and microwave for about 1 minute 15 seconds. Or if you have time reheat in toaster oven until warm. 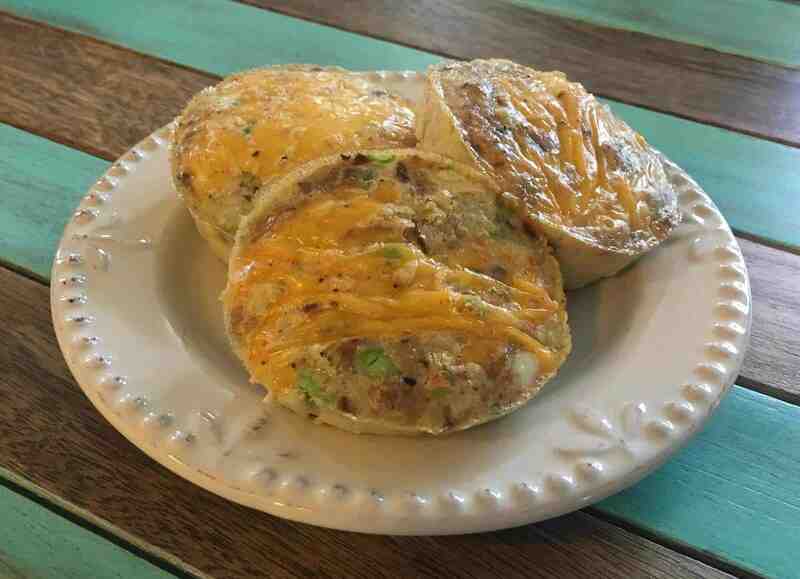 This recipe was adapted from Skinnytaste Loaded Baked Omelet Muffins. I just love Gina’s recipes! Check her out! Usually I like to use olive oil from my Olive Oil Sprayer but in this case, cooking spray works much better. The egg mixture sticks when you use the olive oil sprayer. 7 Replies to "On the Go! Crustless Chipotle Egg Cups"
These look great for a high protein breakfast or snack on the go! Yep! They are! My dad loves them so much! 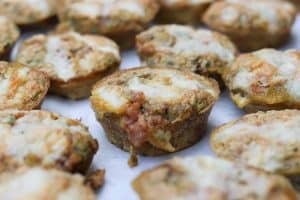 He previously didn’t cook much (he grills) but he loved these so much that he bought the silicone muffin pans and makes them regularly for himself and freezes them for his breakfasts. Super easy and great to have for a fast breakfast. I did not get to try it frozen though the other person in my house ate more to them than I expected! Thanks for the comments Anna! Sorry you didn’t get to freeze a few for later. I find that I have that problem as well when I hace guests, I only eat one but my guests may eat 3. Maybe next time! Very easy to make and I love that I can make 24 at a time! The chipotle is key. It really makes them very flavorful!